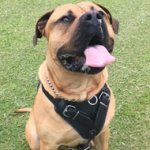 Which Staffy Harness with Patches to Choose? 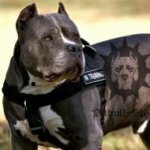 Are you in search of a harness with patches to identify your Staffy? There are two the best harnesses with sign patches. You are welcome to learn their advantages. 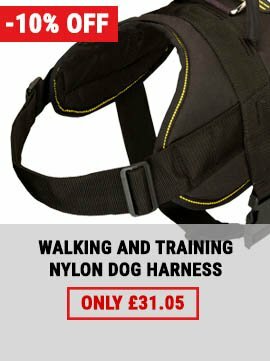 Both harnesses are made of nylon. This is the best suited fabric for everyday use. Nylon is hard-wearing, stretch and tear proof material, which is suitable for any weather conditions. It is resistant to wet and water and is easy to clean. 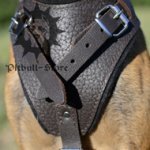 Dog harness patches are on each side. They are of black color and functional signs are made of light color to be clearly visible. You can choose the patches you need among the variety offered. They are fastened on Velcro and are easy to attach. You can also choose blank patches and to write anything to your choice. 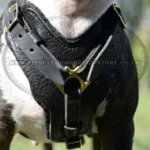 The first nylon harness is multipurpose gear. It is used for walking, training, sport, pulling, K9, police, search and rescue, military, service work and others. 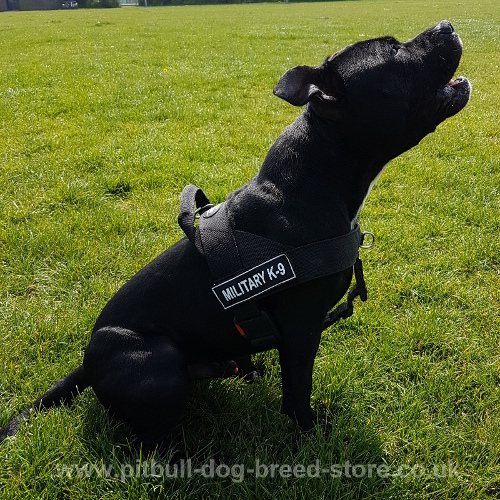 The harness is a real bestseller among Staffy owners, trainers and special units for its functionality, convenience and comfort. It is extremely strong and light-weighted. 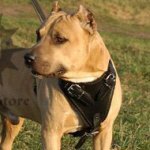 This harness won't hinder dog's movements and won't cause discomfort even if Staffy is harnessed all the day. 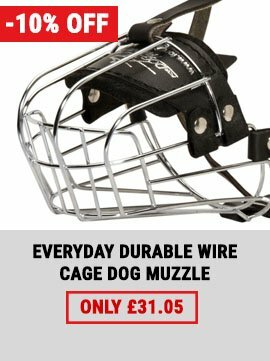 Wide and extra firm straps won't rub or cut into the dog's skin. 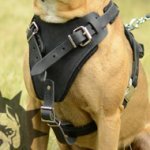 The size of the harness is easy to regulate with the help of straps. Under belly strap is removable. It is used for pulling. There are two quick-release buckles on the harness. One serves for under belly strap detachment. 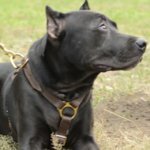 The other one helps to put the harness on Staffy without effort. The harness is carefully sewed. Stitches are straight and even. There are four welded rings of nickel-plated steel on this harness. Side D-rings are for muscles development and pulling. 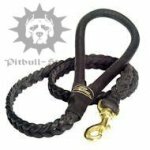 Front D-ring helps to stop dog pulling on the leash. 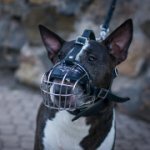 Attach a lead to this ring and your Staffy will be discouraged from pulling in gentle and natural way. Floating O-ring on the handle is for leash connection. 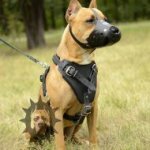 There is also a handle for additional control over the dog. 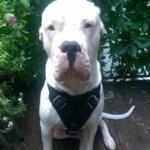 You will be amazed with utility of this harness! The other variant of nylon harness with patches is no less functional. It is of light weight and extra durable. The harness is intended for long-term usage. 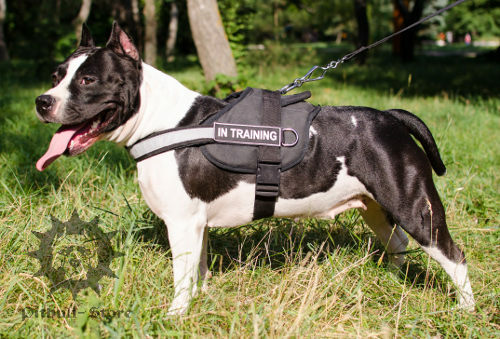 It is suitable for a variety of Staffy activities, such as walking, training, sport, service work and pulling. 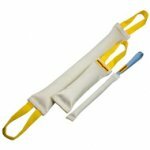 Neck and belly straps are adjustable to regulate the size of the harness. Straps are strong and wide. Quick-detach buckle will help you to put this harness on and off with one click. 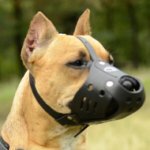 There is a wide back plate with a handle for Staffy control. 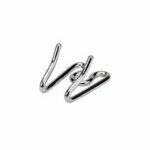 There are 3 welded D-rings of rustless nickel-plated steel. They are reliably stitched to the harness and won't fall off. Side D-rings are for pulling work and the upper ring is for leash attachment. 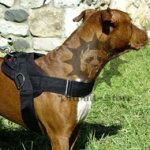 There is a reflective stripe on the chest strap to make your Staffy visible in the dark. 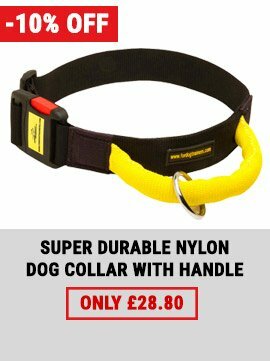 You can walk the dog and cross the road safely at night time with this harness. 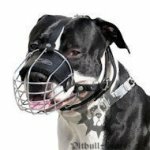 It is maximum functional, safe and comfortable for your dog!